SeeSaw is a great digital portfolio tool that students can use on Chromebooks, iPads, Android tablets, and on any computer that has an updated web browser. Last fall SeeSaw introduced a feature called "Activities" that enabled teachers to create and give assignments in their SeeSaw online classrooms. That feature proved to be a hit! Now SeeSaw is making Activities even better with two new features. The SeeSaw Activity library contains more than 1500 activities created, used, and submitted by SeeSaw's teacher ambassadors. The library is arranged by grade and subject. When you find an activity that you like simply tap or click the heart icon in the activity's title to save it in your own SeeSaw library. Once you have saved the activity in your library you use it as written or modify it to meet your students' needs. Last week when I talked to Carl Sjogreen, one of SeeSaw's co-founders, he mentioned that workflow is one of the things they've worked hard to improve since Activities launched last fall. 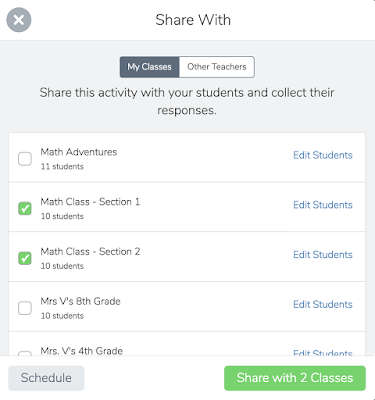 To that end, teachers can now share Activities to multiple classes with just one click. Previously, if you wanted to give the same activity to multiple classes you had to manually open each class and assign activities to students. Now that can all be done from one place when you're viewing one of your SeeSaw Activities. SeeSaw is made up of some of the friendliest people I've had the pleasure to talk with in the ed tech business. If you're at the ISTE conference this week, stop by their booth to see the new SeeSaw features in action.